A New Orleans-area couple with experience brewing beer around the country plans to open Miel Brewery on Tchoupitoulas later this year, part of an emerging Uptown New Orleans “brewery corridor” that has beer enthusiasts excited but some Irish Channel neighbors concerned. Alex Peyroux met his fiancee Janice Montoya while he worked at Abita Brewing Company, and they moved together to Boston when he took a job at Harpoon Brewery there. All the while, Peyroux dreamed of opening his own taproom, and Montoya decided that with her background in marketing, they could bring his idea to life together. 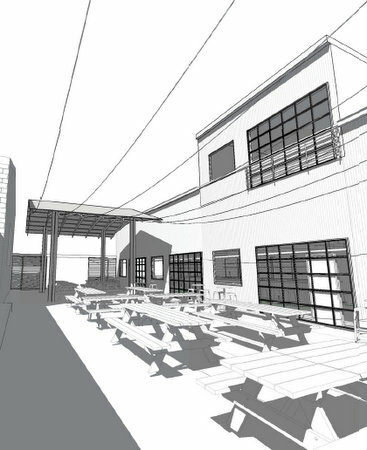 Now, with Peyroux as head brewer and Montoya as the creative director, the two have found a location in a former bus station and industrial building on Sixth Street near Tchoupitoulas where they plan to open in late 2017. 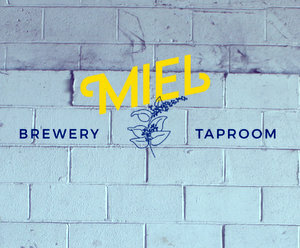 The business will be called Miel Brewery Taproom, using the word for “honey” in both French and Spanish — blending both of their families’ heritages with a key ingredient they plan to use: Peyroux’s father keeps bees, and some of Miel’s offerings will incorporate their wild honey. “We have this endless supply of local honey,” Peyroux explained to the Irish Channel Neighborhood Association on Thursday evening. Miel is building a “brewer’s garden” on his family’s land, the couple added, so that they can grow more of their ingredients themselves. The location is about a block from NOLA Brewing, one of the first small new breweries in New Orleans and a frequent partner with the neighborhood on fundraisers like the ongoing effort to build shade structures in Burke Park. Both are just a skip away from the Courtyard Brewery on Erato Street and Urban South Brewery nearby in the Lower Garden District as well, and Peyroux recalled that City Councilwoman LaToya Cantrell remarked about a “brewery corridor” when Urban South celebrated its expansion in November. The grouping of small breweries is not unusual, Peyroux said, and beneficial for the industry. It foments a sort of friendly competition among the brewers, pushing them all to strive for new heights and innovations with their beers, and it also gives beer enthusiasts a destination where they can try several different destinations in a single outing. “Whenever you find a cluster, that’s where they’ll go first,” Peyroux said. The interior of the building seats 30 people in a private space upstairs and 75 downstairs, said architect Bahareh Javadi. Outside, the courtyard will hold about 100 people in a mix of biergarten-style picnic seating and individual tables that Montoya said may offer other amenities, like a projector screen. Miel’s manufacturing license allows them to sell 250 barrels of beer out of the taproom per month, so they won’t be brewing for distribution — only for sale on location. They will let people take their brews in growlers (refillable jugs designed for beer) and could can some beer for retail sale on site down the line, but don’t plan to distribute it to groceries, they said. “The only place you’re going to find the beer we make is at the taproom,” Peyroux said. Several Irish Channel neighbors, however, worried that the presence of another brewery could create a sort of walking beer bash through the neighborhood. The Uber traffic or parking will congest the streets, and even if the breweries close earlier, their patrons may simply take their party to another watering hole with later hours. And even good intentions can give way to market pressures, said longtime association member Adolph Lopez. “This is the kind of thing we watch develop and see if we want to protect against,” Lopez said. Peyroux and Montoya pledged that they would continue coming to the association’s meeting to stay in touch and promised that they have kept their potential impact on the neighborhood in mind. They hope to direct cars to park on Tchoupitoulas, not in the neighborhood, and have already asked the city’s upcoming bicycle-sharing to consider placing a station nearby. Meanwhile, the brewery itself will lend itself to a more neighborhood-friendly clientele, they said. They won’t serve liquor or wine and plan to offer coffee, tea and other nonalcoholic beverages alongside the beer, and will close by 10 or 11 p.m. Any live music would require permission from the City Council and a meeting with the neighborhood. State laws allow children to come to breweries, so families will be encouraged to visit, and the brewery has event space that the couple said they hope the neighborhood will use for meetings and mixers. The courtyard area in particular could easily qualify as a Superfund site.